While a relatively new tool in the training toolbox, the webinar has quickly become a popular option for training and education. Created in the early 90’s, webinars have been available and in use for many years in the workplace, but the pace of adoption has increased considerably over the last 10 years. So why should you use webinars for safety training? First and foremost, webinars are convenient. Since a webinar takes place over the internet directly to a computer, the need to leave the office or travel has been eliminated. And unlike live trainings, webinars can be recorded. Need to train your entire staff but some are out sick? Not a problem, your staff will all have access to the same training. Webinars are more affordable. So let’s do some math. To send a staff member to a traditional live training costs travel money + training fees + time lost from office = a lot of money. Same training but as a webinar has no travel costs, minimal lost production time and the price of attending a webinar is typically much lower than other training options. And, because multiple participants can train together by viewing the same webinar at a single location, you only need to pay for a single connection. In other words, your entire team can gather in one conference room to attend and discuss the webinar together for the same cost as only one participant viewing the same webinar. Because of all this, pricing per person for training by webinar tends to be much lower than many other alternatives. Webinars are efficient. Most training webinars last only 60 to 90 minutes are scheduled to fit around the work day of your team. Because of this short length, webinar trainers pack in a lot of information into a short time. Webinars are easy to use. With today’s webinar services, registering for and attending a webinar is as easy as using your average email program. Most webinar applications are designed for ease of use and require very little additional software downloads, if any. Webinars have long term value. Because webinars can be recorded and their content and materials accessed again and again, your team members can view the webinar as many times as needed; using it for a refresher course or to train new team members. Training doesn’t need to break the bank; webinars are an excellent way to provide training and education effectively and affordably to your team. 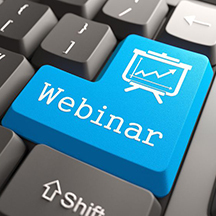 Please click here for additional information on webinars and to view a complete list of the webinars available through SafetyMax.